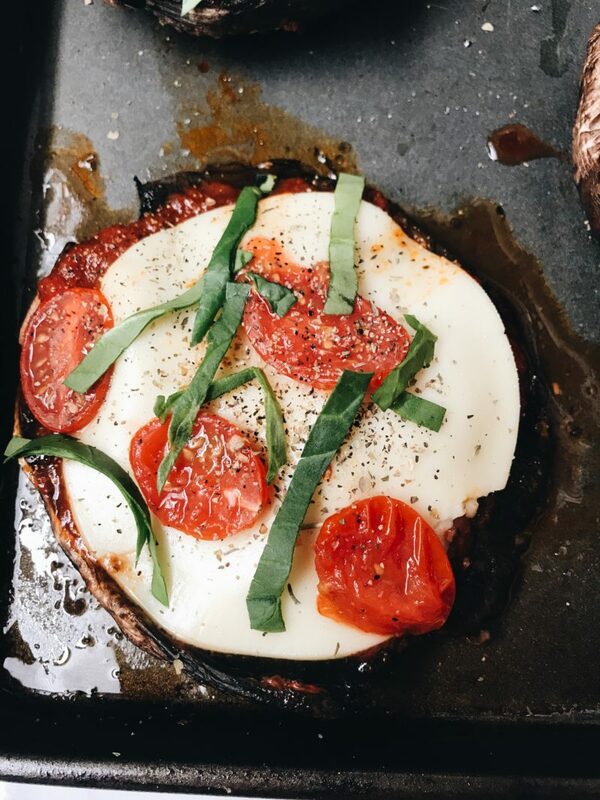 These savory portobello pizzas are extremely easy to make and taste delicious! Serve up with some pasta on the side or a salad! Perfect light but hearty meal. Over the past year I have really fallen in love with mushrooms. They’re super versatile and go great in pretty much every dish/cuisine. 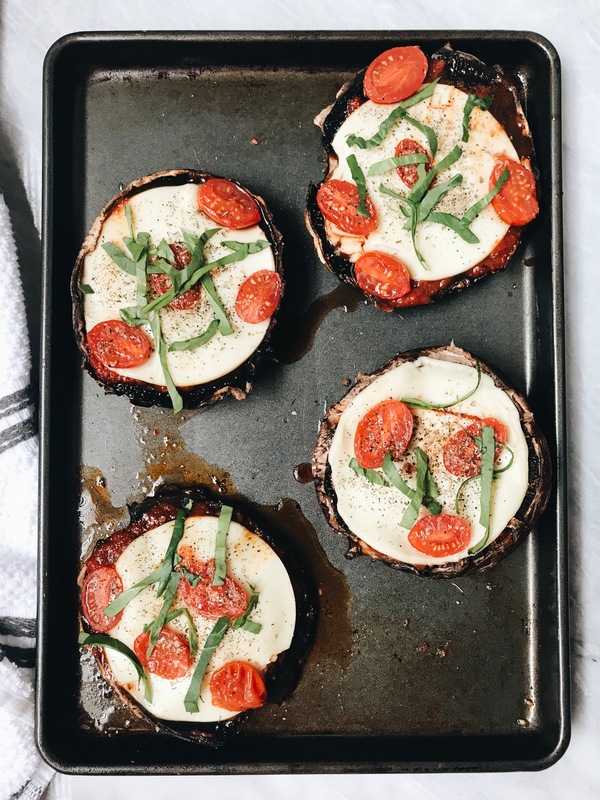 In the past I came out with portobello steaks which were a hit and I wanted to try something different! I think we can all come to the agreement that pizza is life so why not combine the two to create this super hearty and delicious dish. 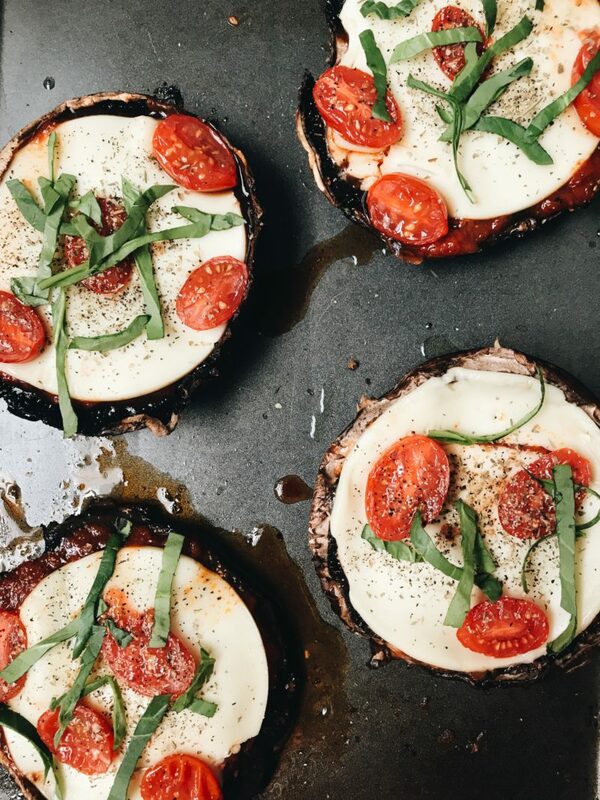 Hack: The brand new Daiya Mozzarella Style Slices fit PERFECTLY inside a portobello mushroom cap. They also melt perfectly and help give this dish that cheezy pizza flavor which is mandatory! 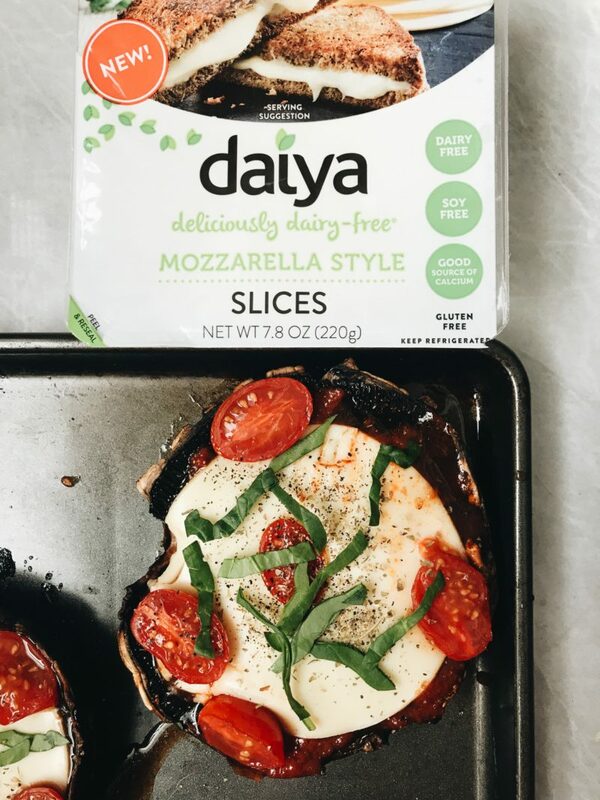 Along with the new Mozzarella Slices, Daiya also has a new Smoked Gouda style slices (which would be perfect in a grilled cheese). I’ve been using Daiya products since the first day I became Vegan. It was the first Vegan cheese I tried because it didn’t contain nuts (as we know it can be hard to find a lot of nut free products, but that’s been improving!). 3 years later they’ve come out with so many new products and I have been LOVING it! 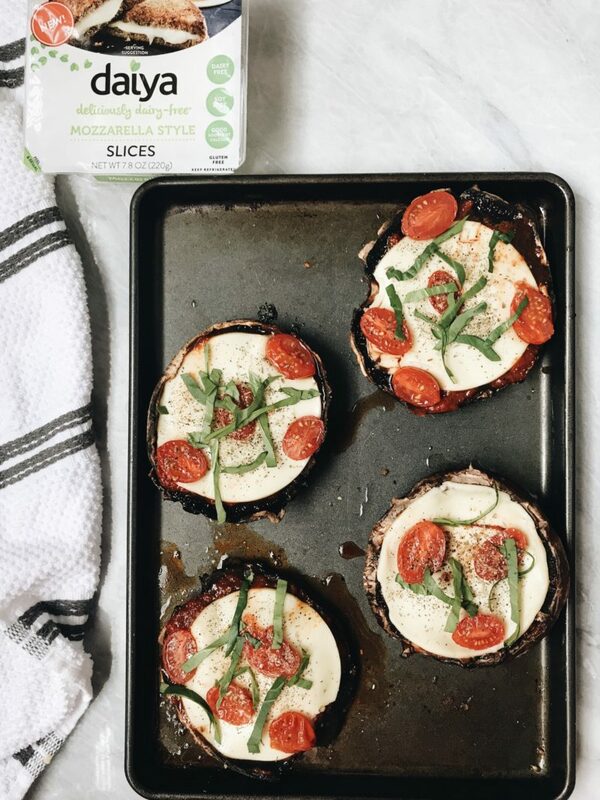 It’s hard to find a good sliced cheeze and I am so happy to now have an incredible line of great melting (or if you just want to have it plain) vegan cheeses. It’s very important to season the portobellos before cooking and not just focus on the “pizza” part. This delicious olive oil “dressing” adds so much flavor to the back of the mushrooms that is very much needed. During high school my friends and I would have pizza every single day for lunch (sometimes it was veggie sushi rolls though). I usually went for a mushroom slice so it is bringing me back to my fantastic metabolism and a vegan version of something I used to eat every day. These are also a great option for your “meatless monday” or just to serve a crowd. Everyone loves pizza so these would be a great option. If you ever make my recipes don’t forget to tag me in the photo so I can see @plantbasedjane! Sometimes when I get tagged in the comments I miss them on my feed. 4 Portobello Mushroom caps, stems removed. Remove the caps from your mushrooms stems and run them under hot water. Dampen a paper towel and wipe down the portobello mushrooms removing any dirt. Set aside. Combine your olive oil with Italian seasoning, garlic powder, salt & pepper. 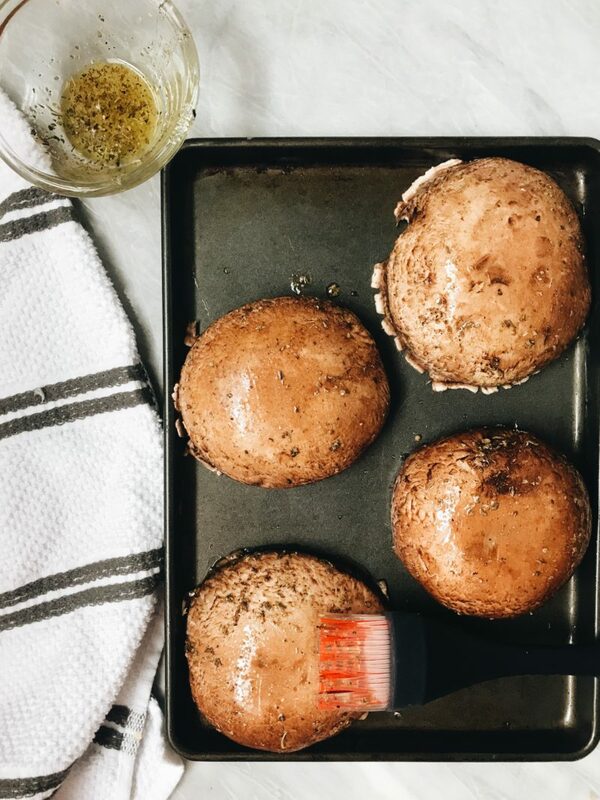 Brush the bottom of your portobello caps with the olive oil mix. Set bottom side down on a baking tray. Fill each cap with 2-3 tablespoons of pizza sauce. Top each with a slice of the Mozzarella slices. At this point you can add whatever toppings you'd like. I used tomatoes but you can use any vegetable or vegan meat. Take out and top with a little extra Italian seasoning and fresh basil. Salt & Pepper to taste. Serve immediately. Thank you to Daiya for sponsoring this post. It means a lot to me to work with brands I love and support plantbasedjane! Do you scrape out the “gills” or leave them? I left them but it’s up to your preference!